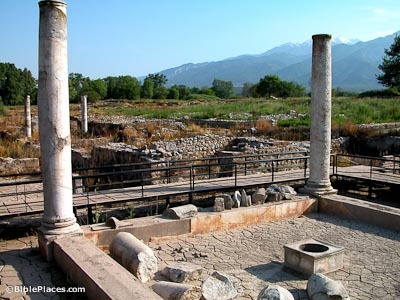 Dion was an agricultural and port city in Pieria, linked to the sea by the Baphyras River. 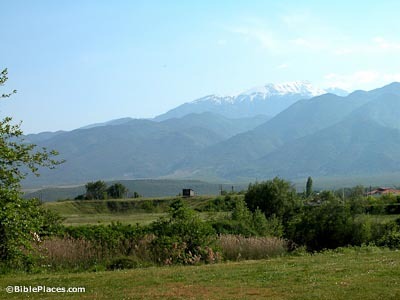 The city was named for the god Zeus (Zeus’ Greek name was Dias), for it sat in the foothills of Mt. Olympus, thought to be the throne of Zeus. Archelaus built a temple to Zeus at the site ca. 400 BC, making it the center of Zeus worship in Macedonian times. He also constructed a theater, stadium, and wall (413-399 BC) and instituted Macedonian games similar to the Olympic games at Dion. Various rulers commemorated military victories at Dion through worship of the Olympian gods. Philip II celebrated here after taking Olynthyos; Alexander sacrificed offerings here prior to invading Persia. Later Cassander set up bronze statues to remember Alexander’s victory at the Granikos (334 BC). The Aitolians destroyed the city and sanctuary in 220 BC under Skopas. Philip V retaliated two years later, crushing Thermon and rebuilding Dion to make it his base. 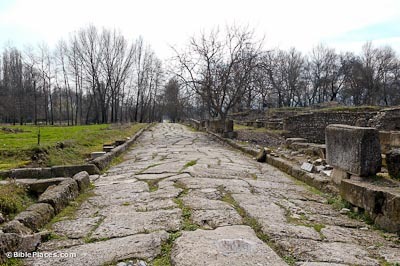 The road depicted at right was part of the original construction of the city in the 4th century BC; the stones visible today date to Roman times. Thessaloniki University has excavated the site since 1928. 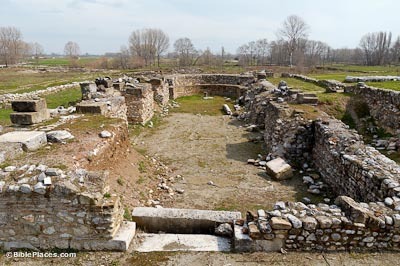 Ten bathhouses have been discovered in Dion, but the great Baths complex is the largest and most luxurious. 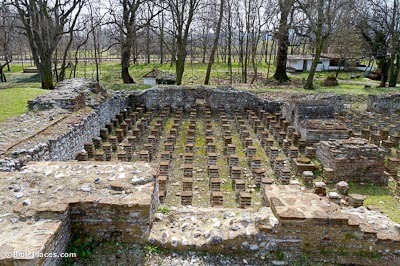 The pillars visible in the photograph supported the floor above the hypocaust, where hot air circulated to heat the room. The rooms were decorated with beautiful mosaic and marble floors. This room was surrounded by a marble bench with holes in it that led to a deep sewer. The sewer line was flushed by runoff from the adjacent bathhouse. The floor was decorated with a mosaic floor with scenes of marine life. 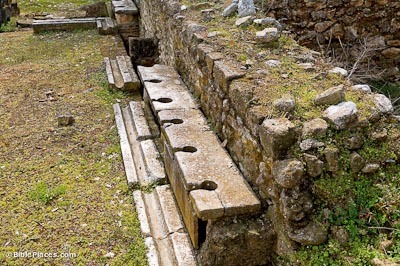 In the Roman period, public toilets were known as Vespasianae, after the emperor Vespasian who placed a tax on them. This villa was given its name because Dionysius (the god of wine and merriment) is depicted in a chariot in one of the floor mosaics. Panthers are shown to pull the chariot, while human sea horses stand on either side. A shrine of Dionysius was also found in this vicinity. Construction began on this church in the 4th century AD; it was destroyed by an earthquake before it could be completed but was later rebuilt. Dion was still prospering and even had bishopric status in 343 AD but declined after being plundered in the 5th and 6th centuries. Dion (Hellenic Ministry of Culture) Offers a general description of the site and its history. Hosted by the government of Greece. Archaeological Museum: Dion (Museums of Macedonia) Provides information about the archaeological museum at Dion and some of its artifacts. Includes photos of some of the more significant artifacts. Travel to Greece (Personal Webpage) No text, but several photos of the site. 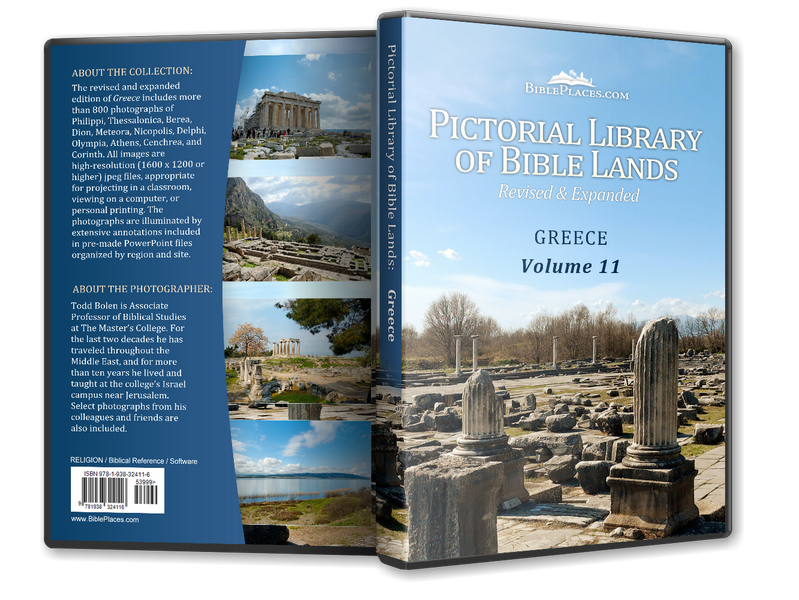 Ancient Dion – A virtual tour of the archaeological park in Greek, English, or German. May take a few minutes to load.